Supacat has won the Queen’s Award for International Trade for Outstanding Short Term Growth. The Queen’s Enterprise Awards are the UK’s most prestigious business awards and announced on HM The Queen’s birthday. Supacat is an innovative engineering and design company, providing products and services globally, including specialist off-road wheeled and tracked vehicles. Over the last three years its overseas earnings have grown from £2.5m to over £32m buoyed by a large Australian order for its Special Forces HMT Extenda vehicle, which has become the vehicle of choice for the world’s elite Special Forces. 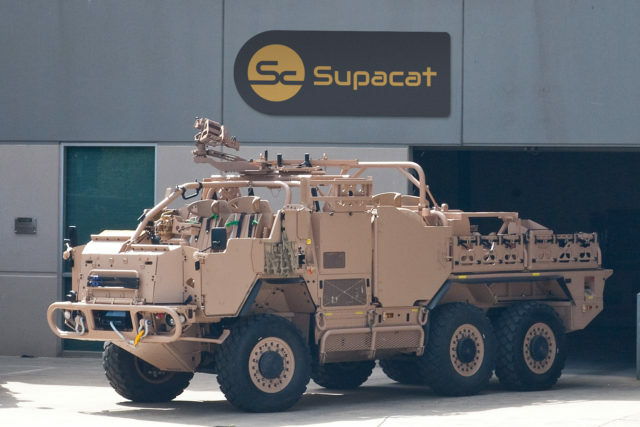 Supacat has recently won Norwegian and New Zealand contracts for the vehicle and the company is actively pursuing emerging opportunities with new export customers for its family of military high mobility and protected vehicles, which includes the acclaimed `Jackal` and `Coyote` operated by the UK Armed Forces. “This is wonderful news for our business and we are very proud to be a winner of this very prestigious award. All the stakeholders of the business are delighted and are enthused to continue to pursue first class export opportunities especially recognising the national need for exports during these changing times. We are particularly proud of this award given the challenging circumstances UK Defence businesses face in selling their products to international customers and into one of the most openly competitive home markets. Financing exports is one of the challenges and we are grateful for the support we received from UKEF and RBS,” said Nick Ames, Chief Executive Officer. Established in 1980 and headquartered in Devon, Supacat’s growth has been driven by the UK defence sector, which continues to be a core business. It is part of SC Group which has diversified into providing engineering solutions to the oil and gas, nuclear, marine and renewable sectors though investment into developing specialist vehicles and services and actively engaging in new international markets including the USA, Middle East and China.